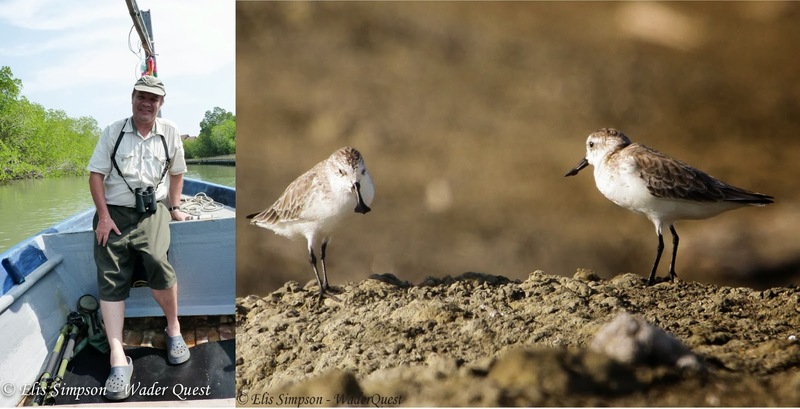 Wader Quest: A very big and heartfelt THANK YOU! A very big and heartfelt THANK YOU! During the last 15 months we have met and spent time with some very special people. People who have volunteered their time freely and opened their doors to help us in our bid to raise awareness and money as ambassadors for waders. There were also a great many people whom we didn't have the opportunity to go birding with but who helped us with contacts, information and directions, accommodation or their company over a glass or a meal. Alan McBride, Gary Waddington, Jason Williams, Barry Trevis, Oliver Simms, Seedy Saidy, Duncan MacDonald, Jim Lawrence, Kieth Betton, everyone at WWT Slimbridge in particular Ellie Wise (UK), John Muddeman, Jorge Garzón (Spain), David Mackay (Mexico), Naina Raharijaona (Madagascar), Nick Upton (Thailand) Garry George, Leslie Nunn, Paul Lehman, Judith O'Neale, Danny and Rob Dobbs, Kevin and Shirley Berken (USA), Ivonne Zepilli (Peru), Adam Riley (South Africa), Adrian Boyle, Grainne Maguire, Mandy Soymanoff (Australia), Kieth Woodley, David Lawrie, Craig Steed and family, Adrian Riegen, Ann and Ray Buckmaster (New Zealand), Martha Argel, Umberto Neto, Roséli Nascimento, Gislaine Disconzi, Rafael Diaz, Suzi Paiva (Brazil), Rodrigo Reyes, Ricardo Matus, Diego and Sole Quevado, Alvaro Jamarillo (Chile) Ram Pratap Singh, Manoj Vardhan (India), Mark Andrews (Thailand). We don't have photos of them all sadly. Wader Quest received sponsorship as follows: Return flight São Paulo/Porto Alegre - Andy Simpson; Return flight Long Beach (CA)/Seattle (WA) - Knut Hansen; Hotel accommodation Bangkok and Laem Phak Bia Thailand (second visit) - Martin Simpson; Road trip South Africa/Botswana/Namibia - Peter and Jenny Sharland & Sue and Owen Oertli (Wader Quest South Africa); cash donation George and Barabara Simpson. Accommodation San Diego - Gary and Leslie Nunn; Accomodation Llandudno - Alan Davies and Ruth Miller; Accommodation Cameron Motel - Judith O'Neale (Louisiana Ornithological Society); Accommodation in Thornwell, Louisiana - Kevin and Shirley Berken; Accommodation Lima - Ivonne Zepilli; Accommodation in Afton Grove (South Africa) - Sue Oertli (Wader Quest South Africa); Accommodation in Foxton - Craig Steed; Accommodation at Miranda Shorebird centre - Keith Woodley; Accommodation Tavares - Roséli Nascimento (Festival Brasileiro de Aves Migratórias).